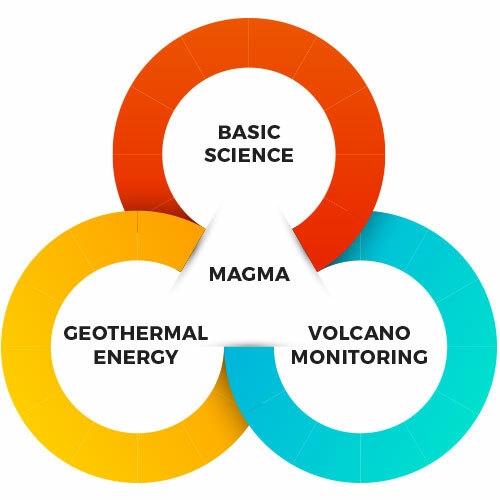 Understanding magma is central to understanding the differentiation of planets (basic science), reducing the risk of volcanic disasters (volcano monitoring), and increasing the quantity and efficiency of geothermal energy production. We stand at the threshold of obtaining fundamental new knowledge of magma in the Earth’s crust. The unexpected encounters with magma at 900oC by geothermal drilling in Iceland’s Krafla Caldera open the door to direct exploration of hydrothermal/magma coupling and the transition from solid rock to magma itself. There is no better place on Earth for scientific drilling into this unexplored domain – Krafla is unique. With a welcoming geothermal partner and host country, easy access, a plentiful water supply and an already-developed geothermal field, Krafla provides the most favourable logistical and environmental considerations possible. Magma has been encountered and closely approached multiple times during conventional geothermal drilling in the volcanic system of Krafla. It is, therefore, one of the world’s best-known geothermal sites in terms of geologic history, geophysical surveys and monitoring. Its 40 existing boreholes provide a sophisticated three-dimensional model of the environment above the magma body. While this challenging undertaking is not without risk and demands due diligence, no technical show-stoppers are known at this time. Benefits to the local, regional and national community transcend power generation reaching to eco-tourism, education and the knowledge economy.